A brisk August Saturday morning, with many Brisbane locals headed to the Ekka. My wife and I? Something much bigger. 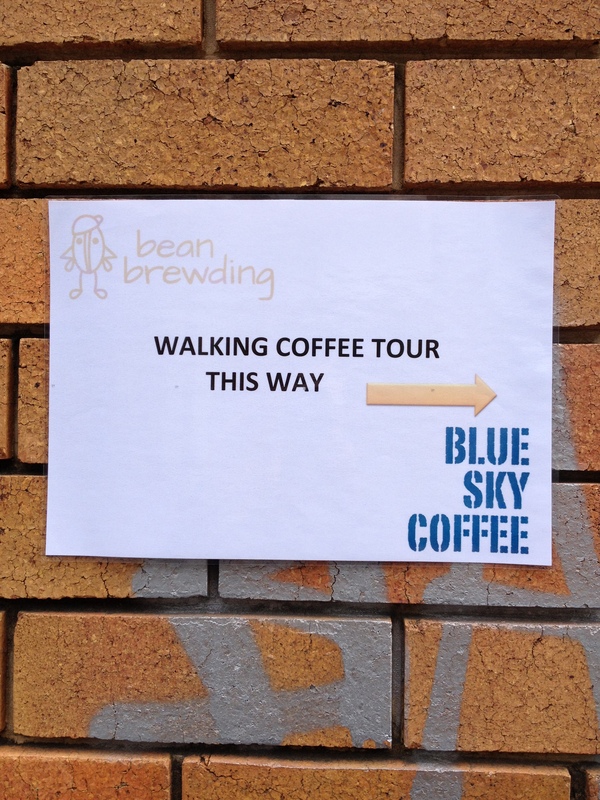 The date had finally rolled around for the Bean Brewding Walking Coffee Tour of Brisbane’s Fortitude Valley. Both my legs and palate were ready for a big morning ahead. Glenn, George and Ben of Bean Brewding describe their website as “the collaboration of three Brisbane coffee drinkers”. In addition to reviewing various independent coffee establishments (league table on the site), they also aim to “to promote the Brisbane coffee scene with quality, quirky and ethical establishments”. I have been a regular reader of the blog and enthusiastic Twitter follower for some time now, and was keen to get on board with the latest coffee tour, after reading about the tours that had been run in the previous 2 years. I also find I tend to become ‘local’ to one or two establishments, and probably don’t visit and experience as many great coffee destinations around town as I should, and this was a chance to do just that, with a few other like-minded individuals. What follows is not intended to be an in-depth rundown of the tour, however highlights what you might expect to experience should you decide to join the guys on one in the future. The first stop for a pre-tour pick me up and breakfast fuel-up was Bear Bones Espresso in McLachlan St Fortitude Valley (whom deserve a special thank you for opening on a Saturday just for the tour). A quick meet and greet from our guides, along with receipt of our tour “passports” and itinerary began the day smoothly. It was the responsibility of owner Trent and the Bear Bones team to educate these ‘tourists’ on the key principles of roasting the humble green bean. A pre-tour chat and slideshow from their visit to Ethiopia also provided a fantastic background into the growing, harvesting, processing and buying which occurs in a typical coffee country at origin. This was followed by a demonstration of a couple of roasts through the sample roaster on the premises, and I was grateful for the opportunity to put some green beans through myself. Somehow the whole process seemed a little more sophisticated than my breadmaker and heat gun roasting set up in the backyard at home. It was great start to the tour, and also gave me some ideas for improving the roasting profiles I use at home, and introduced some concepts I had been unfamiliar with, for example the “double roast”, where the beans are pulled out early and cooled, before being reintroduced to the roaster to continue the process (the aim being to allow the outer surface of the bean to contract by cooling; locking in more of the flavour producing compounds). Interesting – though perhaps a little sophisticated for my skill level. A few final words, bagging of the beans I had roasted to take home, a Bear Bones bag of coffee for each tour member, and we were on our way. A great way to start the tour, and if you are ever in the area, go and have a chat to the guys and have a look at the fantastic art on the walls while you’re there. 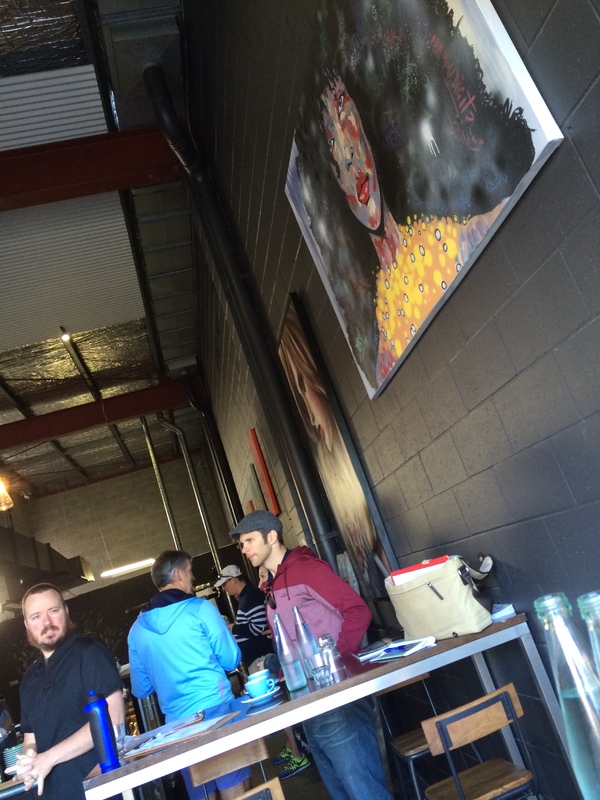 A leisurely few minutes of walking saw us arrive at the bustling Bellissimo Coffee in Wandoo St. Thankfully a dedicated space was set up to accommodate the tour so we did not disturb the regulars enjoying their Saturday morning cup or two. 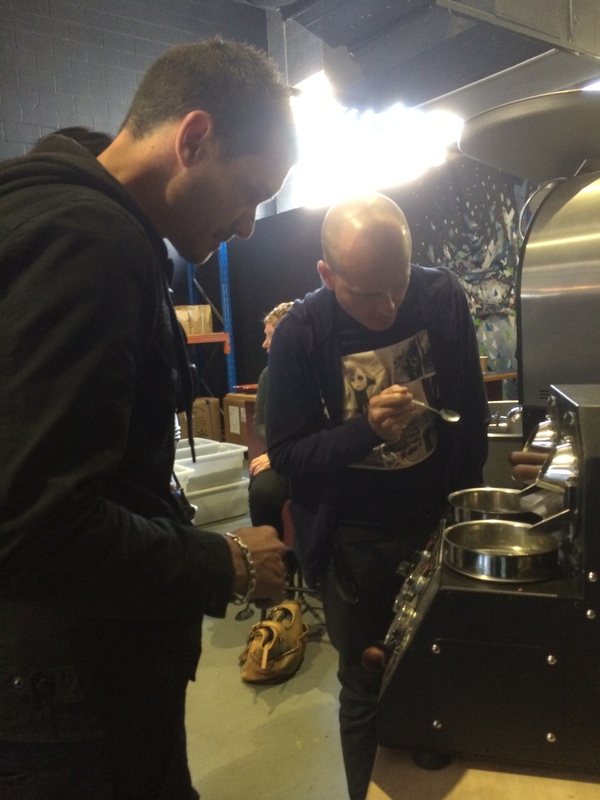 Here we were provided with a background on the principles of making great espresso at home, a demonstration, and the chance to step up and give it a go ourselves. As both a manual brew drinker and user of a home based espresso machine for many years now, it was nice to hear most of the principles and techniques I follow are still considered best practice, and I can happily continue to work on improving my consistency at home. Further discussion ensued around the merits of spending your hard-earned cash on home equipment, and on which specific aspects of a home set-up this should be spent on. Thankfully the conclusions were generally in line with the advice I often give when asked, which is, to save a bit of money on the machine to put towards a decent grinder. I am sure “grind on demand” is firmly etched into a holy tablet somewhere. To finish we received an information sheet containing a 10% discount voucher for Bellissimo and a round of takeaway orders to keep us on schedule. We then sipped a beautiful creamy Bellissimo blend all the way to our next destination. Blue Sky Coffee is certainly an impressive space, with a cafe fronting Commercial Rd, roastery at the rear, and enough space in between to set up some brewing stations for events of high importance such as coffee tours and the like. Danny and the Blue Sky team had three separate stations set up where we learned techniques, and sampled coffee brewed from the V60 Pourover, Espro Press, and Capsule/Pod machines. As you can imagine, two of those three stations resulted in great brews, however you cannot dismiss the burgeoning capsule market, nor deny the merit in efforts by specialty roasters to provide alternatives to the current mass-produced capsules. A favourite of mine was the V60 lesson, as the majority of my manual brewing at home is done with this device, and I am always keen to see how professionals brew using this technique. I generally never leave without managing to pick up a few hints, and this occasion was no different. 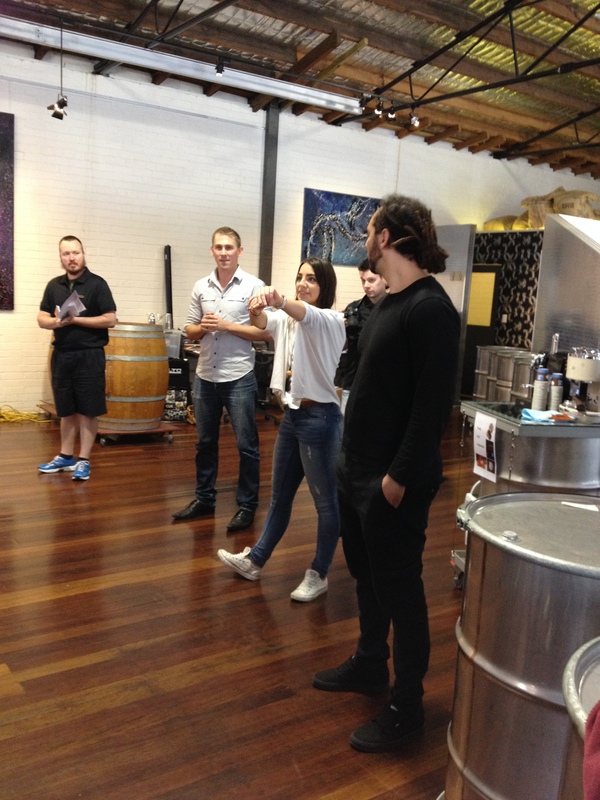 With a view to finishing the tour with a bang, I managed to discuss a few more details on brewing equipment with the staff, and purchased a set of Hario scales to enhance my home brewing endeavours. In addition, I downed an espresso made on a beautiful Ethiopian single origin, and picked up some Kenya Gattina beans to brew at home. All this, along with the $5.00 Blue Sky Credit given to each member of the touring party and some complimentary food, lead me to conclude I had done pretty well for the day. What can I say? My wife and I had fantastic morning out with a bunch of like-minded coffee tragics/nerds/enthusiasts (however you would like to describe us), along with our friends from the Wired Owl Coffee Co. Yes, the tour was primarily about coffee, however to me, events like these are as much about support and appreciation as they are about learning and fun. The three ‘beans’ of Bean Brewding all hold full-time jobs, and it is no mean feat to get something like this up and running, let alone have the day go so smoothly and run to time as planned. In addition to a great learning opportunity, I derive just as much satisfaction from being able to support small, independent operations, whether they are blogs, tours, writers, or podcasts, and have a mountain of Teespring shipping receipts that will attest to this. The Bean Brewding guys have shown a great deal of commitment, organisation, effort, and ultimately courage to pull the trigger and say “the tour is on” – and hopefully then sell enough tickets required to make it a success. Believe me, it was the best $35.00 I have spent in some time. Congratulations guys, your effort is much appreciated. The bonus here? An exploration into something I am just a little obsessed with; a local, easily accessible event; and a fantastic bunch of industry folk happy to get behind the tour, who generously gave up their time to provide something pretty unique, and are not only passionate about their craft, but extremely willing to educate those far less knowledgable than themselves. A big thank-you to all those from Bear Bones, Bellissimo and Blue Sky who made the day such a success. Keep an eye on the Bean Brewding blog for upcoming events, particularly the Coffee Tour page, or follow Twitter or Instagram for snippets and great photos of their travels around the Brisbane coffee scene. Thankfully there are future tours planned, and should I have the opportunity for another, I hope to see you there.